Sitting Pretty: Vanity Sizing? Major Clothing Stores Playing on Women's Insecurities? Vanity Sizing? 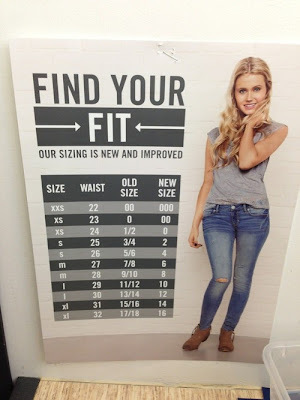 Major Clothing Stores Playing on Women's Insecurities? Have you ever been shopping and found that your size depends on the store that you're in at the time? In one store you may be a size two, and in another you may be a double zero! This phenomenon is known as vanity sizing. Stephanie Clifford, from the New York Times, wrote an article on this topic saying, "A woman with a 32-inch bust would have worn a Size 14 in Sears’s 1937 catalog. By 1967, she would have worn an 8..." So apparently, this activity has been occurring for decades! Some people even argue that vanity sizing affects the self-esteem of women because it puts pressure on us to be a certain size. According to Cosmopolitan Magazine, "... designers tapped into a bankable truth: Women tend to feel better and buy more when we fit into a smaller size." I think it's absolutely manipulative to play on the insecurities of women to make a profit! Beauty comes in all shapes and sizes, and an insignificant number should never measure anyone's self-worth. In the words of Grey Livingston, "Beauty comes as much from the mind as from the eye." I believe that strict rules need to be set in regards to a universal sizing system to clear all of the confusion. Have you ever been one of those women carrying more than one size into the fitting room to see which one fits the best? I know I have! This not only tricks women into wanting to purchase more of the "smaller" sized clothing, but also puts most of our shopping experiences at a disadvantage because more time is now spent on trying to find the right size. How do you feel about vanity sizing? Are you for it or against it?